This is a photo of my brother Jeff and Gina – at a restaurant on the bay near Fort Meyers, Florida. Really, this post is about the class that helped really solidify my photography skills and knowledge. Not only did it teach me so much, I have made some wonderful friendships through this class. So, if you want to take your DSLR out of auto and really see what you can do, sign up for this class – you will be so happy that you did! 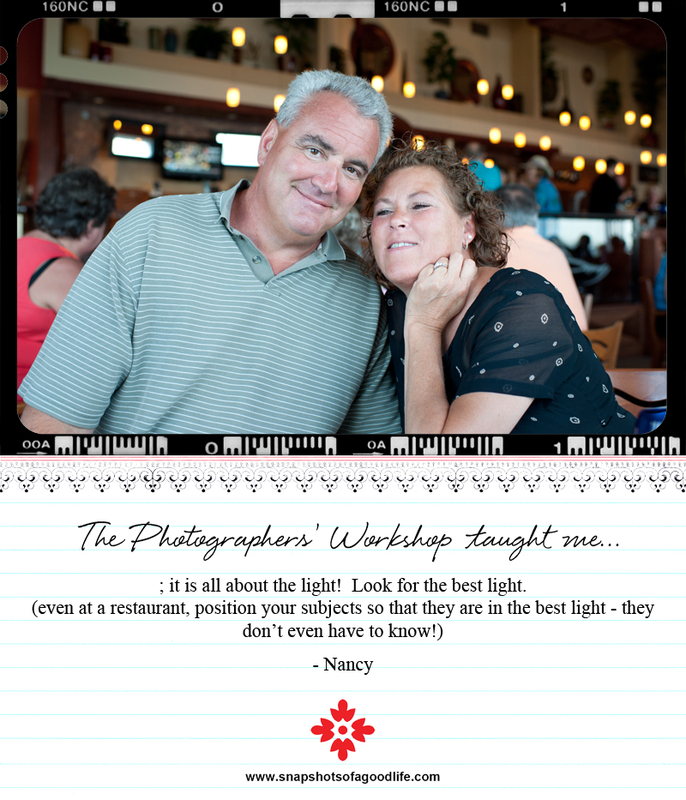 Edited to add: Karen Russell, the instructor/owner of Snapshots of a Good Life – my teacher added a comment on the blog and said my photo was fabulous! That makes me happy! I didn’t even say what a wonderful teacher and all-around good person she is – you will love her! This entry was posted in Uncategorized and tagged http://www.snapshotsofagoodlife.com, Karen Russell, photo, photography, photography class by Nancy McPeak. Bookmark the permalink.